Home › SQL Server › T-SQL Tuesday #050: Automation, how much of it is the same? A new year is always a time of great joy and celebration for most of us. For some of us it is a chance to start something new. For a select few, it is time to laze a little and let the haze of winter pass by. To all of you, here is to a great year ahead! Cheers! Your post must be published between 00:00 GMT Tuesday, January 14th, 2014, and 00:00 GMT Wednesday January 15th, 2013. Thanks for the topic and for hosting! Here’s mine… I got the right person this time 🙂 http://sql313.com/index.php/menu-main-blog/14-maincat-dba/cat-automate/51-tsql-tuesdays-50 Thanks for hosting! And my contribution – http://martincatherall.com/2014/01/15/tsql-tuesday050-automation/. 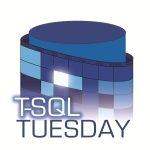 Cheers for hosting the first T-SQL Tuesday of 2014 and also the 50th edition! My first participation – hopefully I’m clear! I was in a bit of a hurry due to a snow storm/blizzard – time to head home!